One of Charlotte Mason’s principles is the Book of Centuries. She encourages each child to add important information to their Book of Centuries (BoC) as they learn. What should go into a Book of Centuries? We paste our famous artists at their date of death. Paste specific masterpieces or inventions on their dates. Simple key words to summarize. 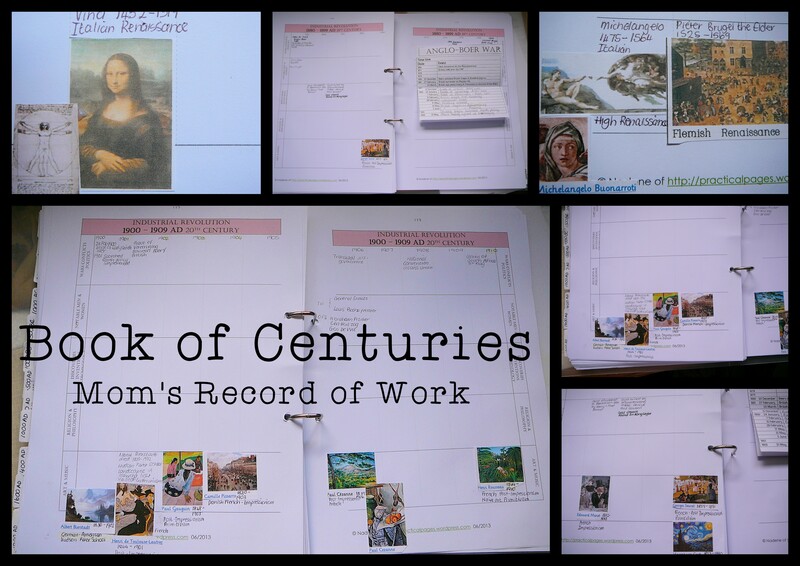 As we cover a theme or topic, an era or event, learn about a famous artist or musical composer, we spend a few minutes and jot it into our Book of Centuries. Sometimes this activity is a great introduction and provides a neat “bird’s-eye view” of the era we are going to study. Other times, it provides a good conclusion/ review of our study. From 3000BC to AD 1500 allow a 100 years per two-page spread. From AD 1500 to AD 1800 allow a fifty-year span per two-page spread. From AD 1800 to AD 1900 allow a twenty-year span per two-page spread. Punch the correct side of the pages, The pages face each other, all the even pages on the right side, all the odd pages on the left side. File the pages and glue the backs of the pages to each other. 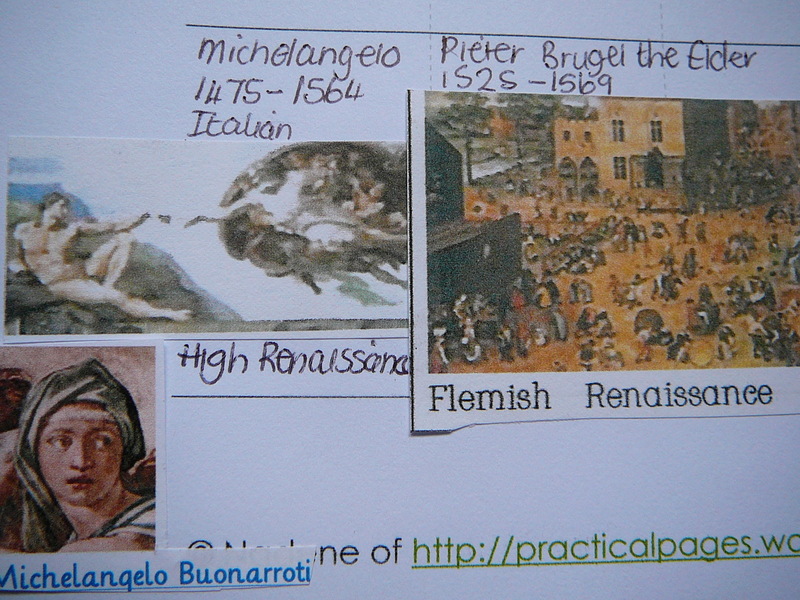 Index the centuries with stickers or tabs. l smile as I browse through my Book of Centuries and I fondly remember our homeschool journey over the past year. I could also use different coloured pens for each child’s studies or different curricula that I may use over the years … we’ll see. Go on moms, make your own BoC! ← Maths Matters – What Works! Love this! All my TFN will too, or homeschooling moms, or those who love history! Just reposting it so I can find it later! Hello Nadene. I have been popping in here for some time now and every time you share I think of how I would like to wrap my mind around a more freeing less text book style learning. I like the organized planned our books but know there is more to life than them, so I hope as we continue on our homeschool journey that we continue to add in wonderful books as I have been trying to do more of at each opportunity while we can offord. *smile* I have been thinking, since you made this post that we may start a family book of centuries with your help here and using the Donna Young page layout ideas. I will humbly admit that I am a little scared to get it going, but with our son getting ready to start into American History next year (I think it will be an introduction in our curriculum not a full on cover of it) I thought I would take it one step farther with the book of centuries. I am also peeking in Ambleside for some ideas on how to cover history as we haven’t really done very much with it except biblical history. I have also found that our family enjoys the Drive through History DVDs and may consider adding them to our DVD collection. Thank you for continueing to share your homeschooling experience here with all of us and for sharing your free things on the side. I hope your family is entering the new year with hearts full of Joy and I hope your farm is richly blessed by the Lord. Sincerely, Mommy of two growing blessings & so much more! We are using Laurie Bestvater’s Book of Centuries because it is so lovely and a wonderful companion piece is her book The Living Page, which helped me finally figure out notebooking from a Charlotte Mason perspective. Thanks you for taking the time to share what you and your family are doing. Your book of centuries is perfect! Exactly what I was looking for. Thanks so much for sharing your work! God bless. What a great idea. Wish I had been privy to this idea when I started home schooling 10 years ago. What a great way to keep a record. Not sure it is worth starting one now as may only 3-4 years to go. @Leanne, If this is an idea you enjoy, just go ahead and do it! I “caught up” my BOC in one afternoon a few years ago! 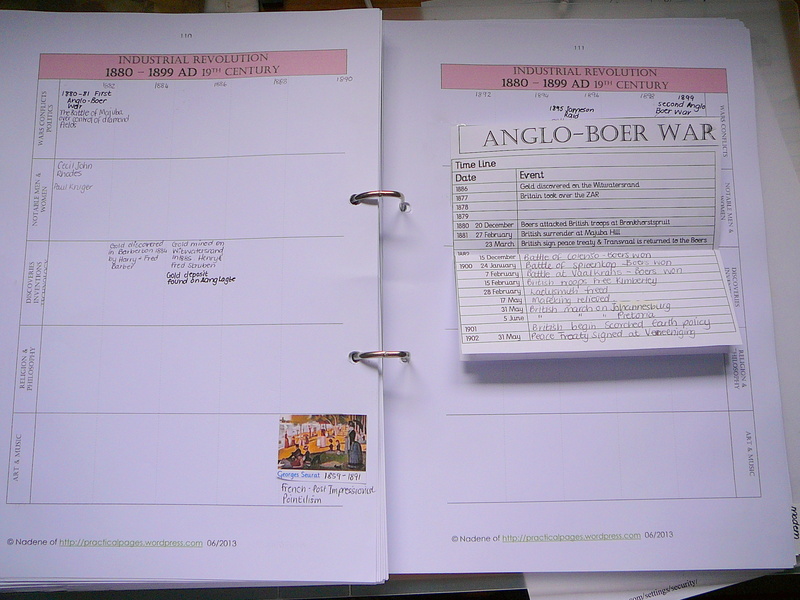 I simply took each History Core book we had studied and wrote in all the events, wars and famous people studied. The next day I took my Art Era Timelime and cut it up and pasted all the thumbnail-sized pictures in the main art eras, included all the famous art works and artists, and my BOC was instantly filled with color and info! In fact, if this is something your kids have let slide, it makes a good recap and overview activity which they might also enjoy!